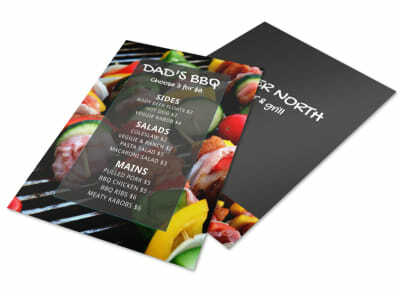 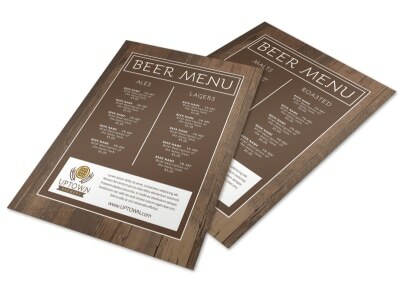 Take the fast and easy route to professional-looking menu design with food & beverage menu templates. 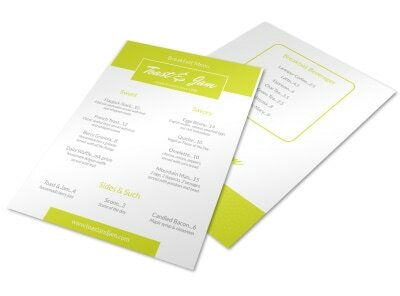 Use our pro-designed templates and intuitive online editor to create a menu that wows guests with your choice of colors, graphics, photos, and other elements. 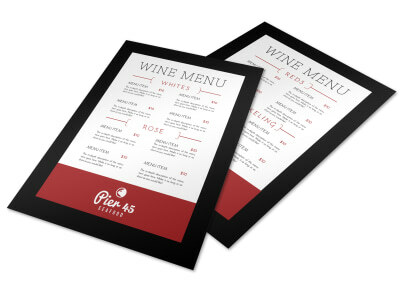 Add images of your best-selling dishes, and insert text in fonts customizable by type, color, size, and more. 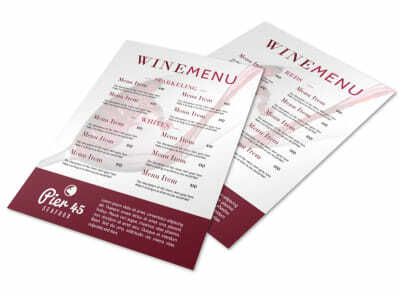 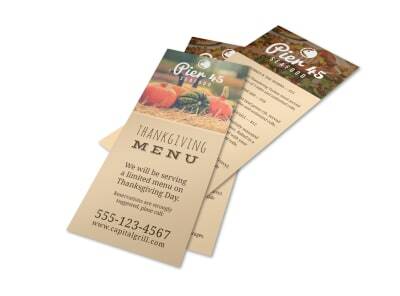 The process is simple, fast, and fun, and your menus are instantly printable from your own printer. Get started on a yum-inducing menu design today! 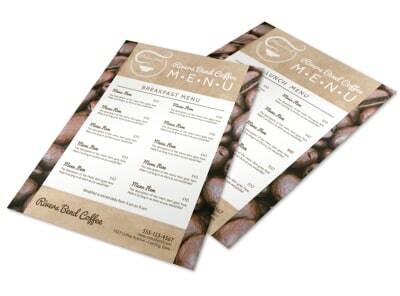 Your menu is the first impression most people (potential customers) will get of your bakery. 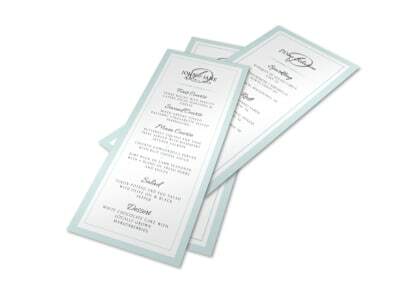 It’s the one document that can truly pull people in or turn them away. 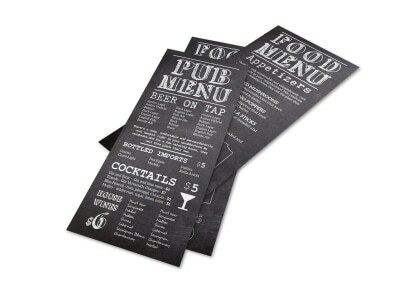 Win them over with a charming menu flyer that piques their interest and makes their tummies rumble. Tasteful photos of your baked offerings will go a long way towards increasing your orders. 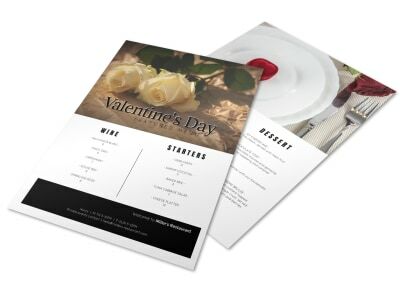 Make sure to include your hours of operation and prices for single items, half-dozens, and dozens, along with any special promotions or services you offer, like delivery or catering. 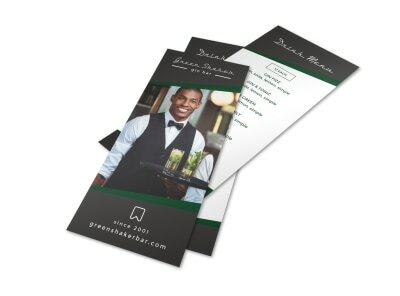 Our online editor makes it simple to upload your own logo and images and keep your branding consistent – get started now! Your bar’s customers enjoy being where everybody knows their name and is always glad they came. Take the time to equip them with everything they need to extend the same courtesy to you and your kitchen by offering custom-designed bar menus so they can call everything by name. Put together a happy hour menu that ensures it’ll always be 5 o’clock somewhere, tap into your creative side as you craft a menu featuring your daily food and drink specials, or quench your patrons’ thirst with a refreshing drink menu that really hits the spot. 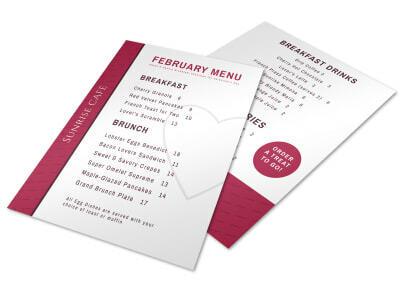 Our online editor gives you all the tools you need to act as your own designer. 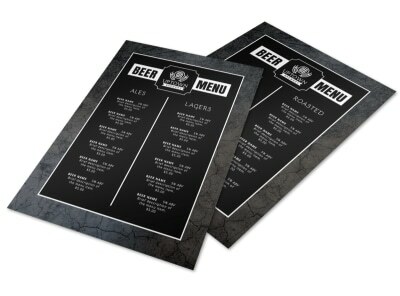 If you like, we’ll even handle the printing for you so that you can grab a cold one for the next customer! 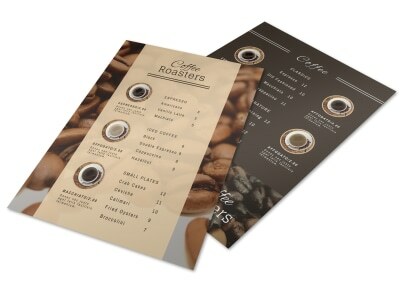 Enable your coffee-seeking customers to know exactly how to respond when you greet them with “what can I get started for you?” by customizing a fabulous coffee shop menu that leaves nothing out. 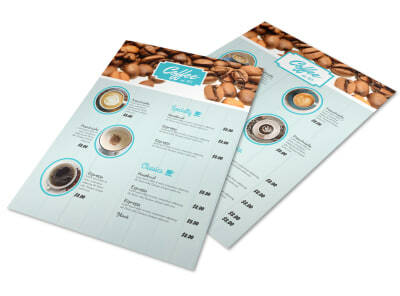 Begin by choosing one of the enticing coffee shop menu templates our pros are constantly churning out. Make it your own by matching the color palette and logo to your existing branding using our easy-as-fresh-baked-biscotti online editor. 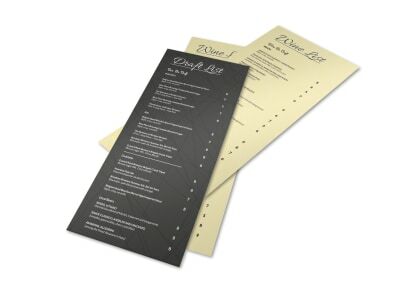 Once you have the perfect foundation, start filling in your menu options. Lay out your signature drinks, basic beverages, baked goods, catering details, and more along with your hours of operation, location info, website, and phone number. 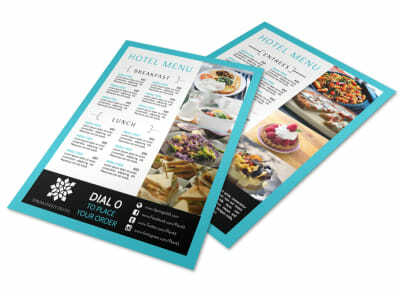 Encourage customers to take a menu home with them (or to the office) and send one out with every workplace or catering order – repeat business is the best kind! 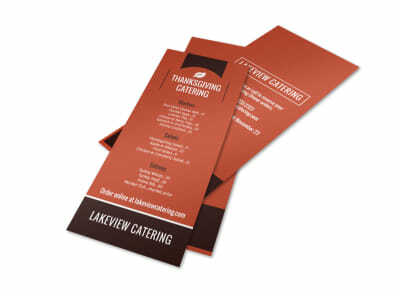 Potential catering clients are looking not only for a reputation they can trust, they’re looking for a menu they LOVE that fits their event. 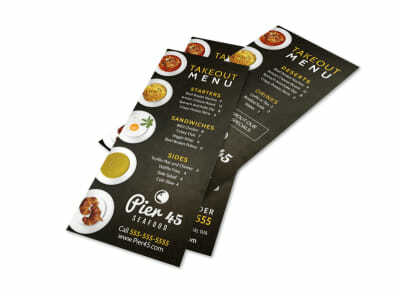 Give them both when you customize a delicious and classy catering menu that builds confidence in your business and your food. We’ve got the perfect template for you – look through our professionally-designed offerings and find it! 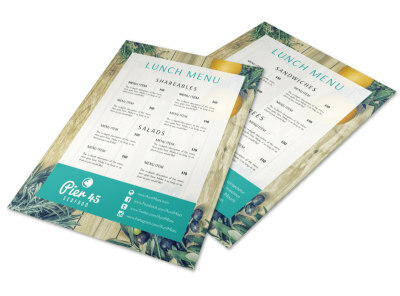 Use our online editor to make it your own – upload mouth-watering photos to get clients’ tummies rumbling, choose the right fonts and color scheme, and craft a tasty layout. 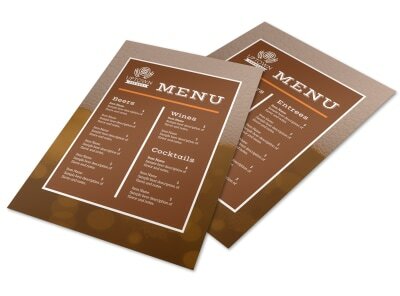 Highlight your most popular packages and dishes, then group the rest of your offerings accordingly. 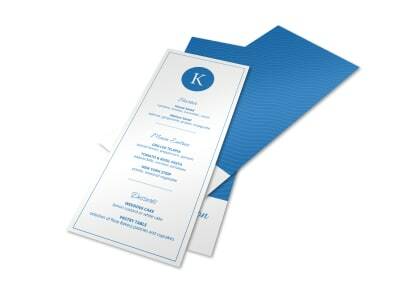 Post it to your website as a PDF, email it to interested event planners, print it yourself, or give us the go-ahead to do a premium print job that saves you the headache and lets you get back to the kitchen. 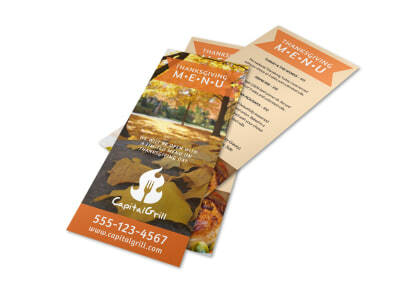 It’s in your hands - we’re here to help you do you! 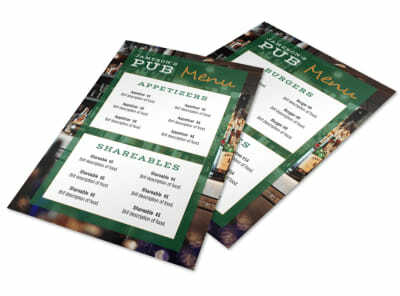 “Sometimes you want to go where everybody knows your name” – your bar patrons want you to know their name, but they also want to know the names of their favorite food and drink orders. 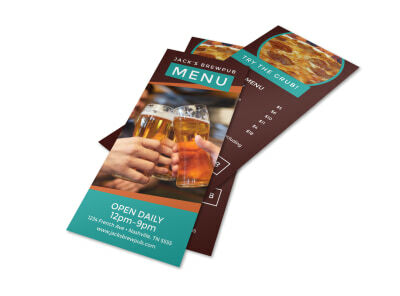 As someone who sees that “our troubles are all the same,” empathize with them by personalizing a friendly new bar menu that helps them “take a break from all [their] worries.” Begin with what’s always on tap, and a shout-out to seasonal offerings (Summer Shandy®, anyone?). 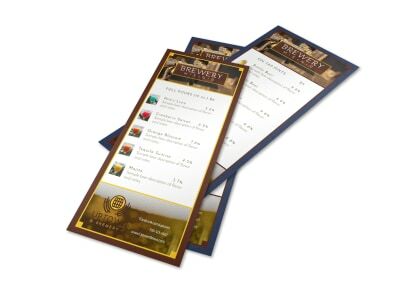 Follow with your bottled brews, ciders, and malt beverages, and round your drink selections out with local favorites and original concoctions. 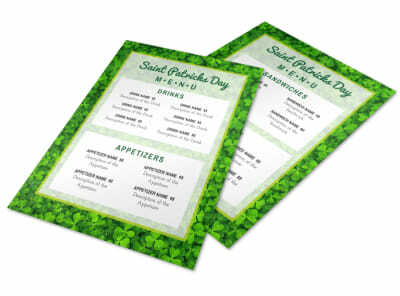 No social establishment menu is complete without a slate of classic and updated bar food options – signature sandwiches (traditional reubens, meatball subs, grilled cheese), ever-popular apps (mozzarella sticks, chicken wings, nachos, deep-fried anything), and flame-grilled burgers (the possibilities are endless). 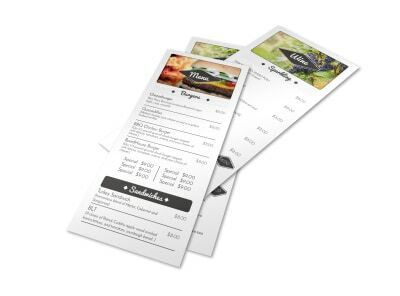 MyCreativeShop’s online editor wants to walk alongside you because “making your way in the world today takes everything you’ve got” – we won’t leave you hanging! Trying to come up with a high-impact, low-cost way to give your restaurant a breath of [deliciously yummy] fresh air? Take a few moments to DIY a completely-customized and professional menu redesign. 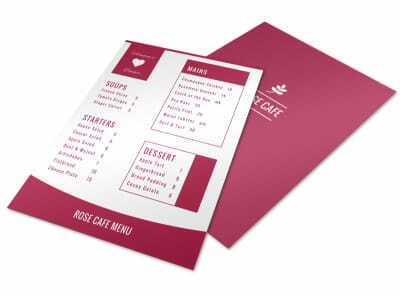 MyCreativeShop employs designers who are always hungry to create the next great restaurant menu template. Order up one of their creations, then use our online design kitchen to fill in all the key details – your logo, signature dishes, and other menu items. 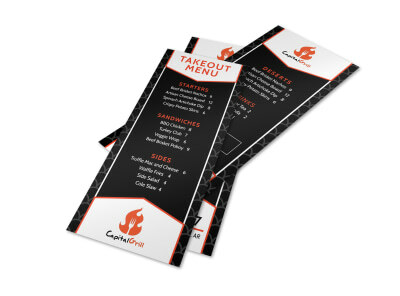 You can also take advantage of the menu redux to pare down your less popular offerings and add in a few new soon-to-be favorites. 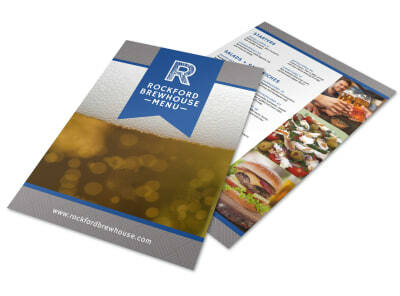 Send your finished carte du jour to your local print shop or let us deliver a hot and fresh stack of brand-new menus to your waiting hands. Top-shelf oenophiles and box wine devotees alike will appreciate a descriptive and well-laid out listing of the wines you have to offer. 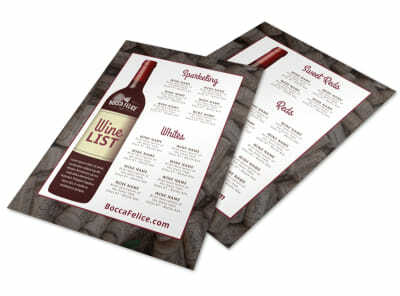 Take matters into your own hands by customizing one of our professionally-designed wine menu templates. Whether you specialize in hard-to-get, high-end vintage bottles or offer mainly accessible and popular makers, your wine menu should be easy to understand. 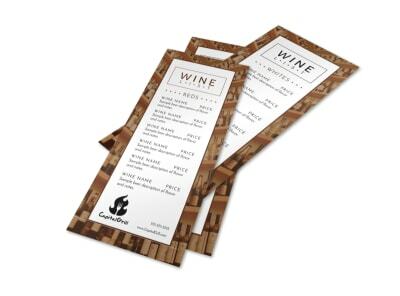 Use our online editor to include prices, recommended pairings, and comments about taste profiles. Your completed menu can then be printed for use in your business or easily shared via email or social media – a great way to stir up a buzz about your offerings!